Rainforest Guesthouse is run by Nora which is the best cook in Bukit Lawang. 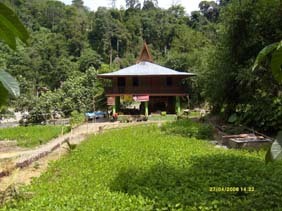 The guesthouse is located right on the Bohorok River overlooking the jungle. The Rainforest Guesthouse couldn\'t have provided me with a better experience in Bukit Lawang. A paradise away from home, the Rainforest Guesthouse, all the guides and staff are absolutely incredible! I hope to come back VERY soon! Out of all the hotels/hostels I have stayed at over the passed 4 months in Asia, the Rainforest Guesthouse is by far the BEST! Thanks for an amazing stay Nora :)! I did stay here and it was really awesome. The best thing about the rooms is when you wake up and step out of the door, the first thing you see is the river, the rain forest and a few monkeys. I don't know what kind of food Gemma had over there, but I really didn't like the food (except for the fruit salads). 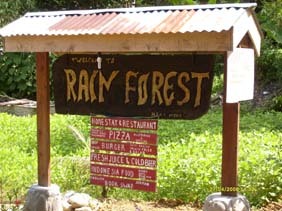 Rain forest is a simple and good accommodation. Didn't stay here but the food was fantastic. Nora is a lady too! Love this place! While the rooms are modest at Rainforest the service is great and Nora has to be the best cook in Sumatra. Try the chicken randang that she cooks. It is awesome. Have you stayed at Rainforest Guesthouse?